The Forest Hill Historic District is an irregularly shaped residential district comprised of eighty-one single-family homes in Cleveland Heights and East Cleveland. The district sits entirely on land once owned by John D. Rockefeller who, together with his son, John D., Jr., was instrumental in launching the development of the Forest Hill District. In 1873 Rockefeller began to purchase large plots of land in East Cleveland and Cleveland Heights. By the end of the decade, he had established a summer home on the East Cleveland property. He named the estate Forest Hill and its mansion, the Homestead. After the Homestead burned in 1917, attention turned to development of the estate, and the Rockefellers began a series of protracted negotiations with the City of Cleveland Heights. Finally, in October 1929, just weeks before the stock market crash, an agreement was reached. Barton R. Deming, who had demonstrated his prowess in the Euclid Golf Allotment, was selected as the developer and New York architect Andrew J. Thomas was hired to design the buildings. 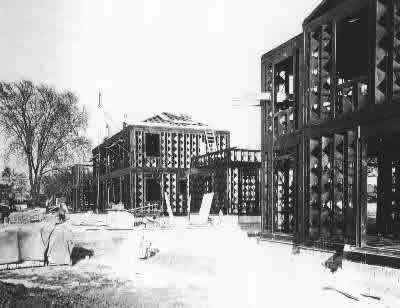 Steel-frame construction of Rockefeller homes. Photo courtesy of the Rockefeller Archives. Deliberately imitative of Euclid Golf in many ways, Forest Hill was also to reflect Garden City principles. Monticello Boulevard was to be its grand thoroughfare, and the projected 600 homes would be constructed in a uniform style amidst a park-like atmosphere with gently curving side streets. However, Forest Hill was also to have apartments and be anchored by a commercial and office complex (the Heights Rockefeller Building). And, unlike Euclid Golf, it was to be racially exclusive: restrictive covenants were attached to the property deeds, forbidding transference of properties to Jews and African-Americans. Eventually, the ravages of the Great Depression forced the developers of Forest Hill to scale back their plan dramatically. Only a fraction of the originally projected homes were built, and these form the Forest Hill Historic District. Much of the remaining land was sold to other developers, who constructed homes at a modest pace until the boom years that followed World War II. 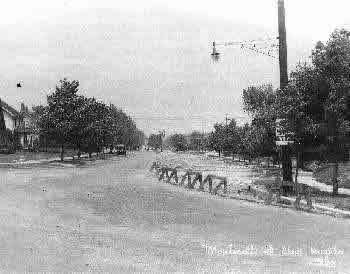 Construction of Monticello Blvd, c. early 1930s. commercial and office complex (the Heights Rockefeller Building). And, unlike Euclid Golf, it was to be racially exclusive: restrictive covenants were attached to the property deeds, forbidding transference of properties to Jews and African-Americans.